Welcome to the Corgi Engine Documentation. Here you'll find everything you need to know to create your own platformer game! 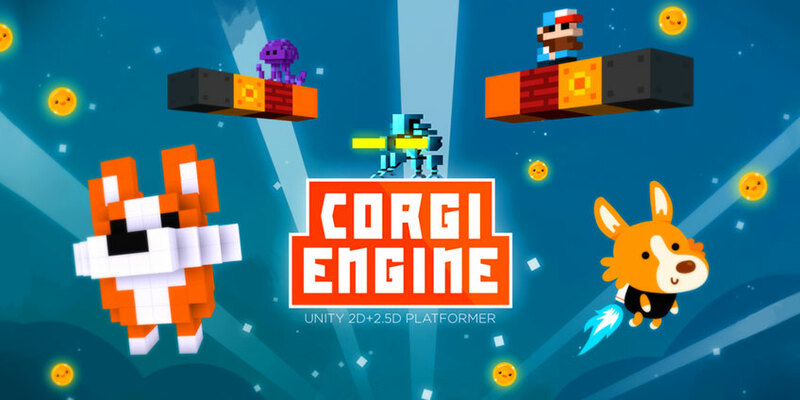 The Corgi Engine is a Unity 2D + 2.5D Platformer Kit, available on the Unity Asset Store. It’s a very fast, non-physics based controller for your player, plus many other features, described below. It’s mobile friendly, works well with other assets, and is basically everything you need to start creating your own 2D game right now. First of all, you don’t have to read all that documentation. The engine is built with Unity good practices in mind, and is packed with help boxes. So if this is not your first Unity project, you’ll probably be ok on your own. And you can always go back here if something’s not clear. That said, you can use the menu on the left to get to specific places. This documentation is functional. If you have questions about the code itself, you’ll rather want to have a look at the API documentation. It’s also recommended to look at the code’s comments directly, usually they cover pretty much any question you might have. If you want a list of features, or are wondering if this or that is included in the engine, you can have a look at this page. It also includes a changelog, and other useful stuff. There are also video tutorials on Youtube. And if all that doesn’t help, you can always use the support email link on the Asset’s page.